The small white clapboard house 1840 E. Front Street in Scotch Plains has been eyewitness to many events in its history since it was built in the early 1700’s. Both British and Continental troops marched past its front door during the Revolutionary War years; the Swift-Sure stage raced past on its way from New York to Philadelphia in the early 1800’s; generations of village children skipped its footpaths on their way to old School One; families name Osborn, Hetfield, Harper, Coles, Kelly and Snook called the little cottage “home; and since 1972 the old house has become our village museum. The careful construction of the house is typical of the early period-wooden pegs rather than iron nails, plaster made of crushed oyster shells strengthened with animal hair, low ceilings and doors, and brick filled walls. The original owners, Jonathan and Abagail Osborn, raised thirteen children in this snug home. Jonathan was an inn-keeper, farmer and tailor. His tavern was farther west on Front Street near Terrill Road. During this same period, the birth pangs of a mighty nation were also being experienced. Two of the Osborn sons helped the infant country survive by enlisting in the Army when the Revolutionary War broke out. John Baldwin the eldest, fought in the Revolution. Son number two, Jonathan Hand, was only 16 when he joined the troops as a drummer boy. The eldest son, John Baldwin, who “bearded the British Lion under Washington”, had left his home on Front Street to live in a larger home (at 2117 Westfield Avenue) when he married Mary Darby in 1774. While he served in the Army, his wife kept the home, cared for the children and became a heroine in her own right. In June, 1777, following the Battle of Shirt Hills fought near Ash Swamp in Scotch Plains, the American Army retreated before British General Sir Wlliam Howe and headed toward the safety of the Watchung Mountains. The Soldiers were “…in great destitution, some being without tents, blankets, shoes or provisions and under the utmost depression of sprits”. Young Mary Osborn, heart-sick at the plight of the men, immediately “…exerted herself with patriotic zeal to supply their wants, and gave for that purpose everything eatable or wearable that her house afforded”. Ironically, at approximately the same time Mary was helping our cause, a Colonial artilleryman fired his cannon in the direction of the oncoming British who were marching down Park Avenue. The shot was misdirected and thudded into the side of the Osborn house. 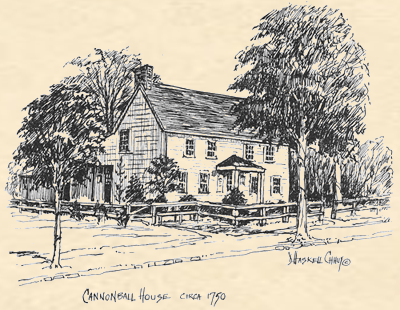 From then on the townspeople referred to the house as the Cannonball House. Mary’s husband, John, lived his life as a farmer and acquired over 4000 acres of land. He later became a Deacon in the Scotch Plains Baptist Church and “sat under all the preachers for nearly a hundred years”. His brother, the drummer boy, later became a fine stone cutter whose work can still be seen on some of the hear stones in “God’s Little Acre” next to the Baptist church in Scotch Plains. One of the younger brothers, David, Grew up to become the first clerk of the newly formed Westfield Township in 1794. He also was the first postmaster of Scotch Plains beginning in 1804. Today the old Osborn place has been carefully restored and furnished by the Historical Society of Scotch Plains and Fanwood. Visitors can readily see the original wide floor boards and hand hewn ceiling beams. The original kitchen has been uncovered complete with bee-hive oven and recessed porch. One of the old parlors is furnished with Victorian pieces and the other front room is decorated with Colonial furnishings. A Colonial flower and herb garden surrounds this little house, giving it the dignity and prestige its years deserve.